In this world of modern specialization it can seem as though our health and well-being are completely out of our hands. When we feel sick, we see a doctor. For our mental/emotional health, we consult a psychologist. To maintain a healthy body, we seek the services of a massage therapist, a chiropractor, or an acupuncturist. And whenever we have a health concern, we search the internet for an expert opinion. Healing work is a noble profession, and the compassionate care we receive from healing facilitators is a blessing. Certainly, the physical, mental, emotional, and spiritual benefits gained by seeing different healthcare professionals are many. At the same time, Western culture and lifestyle has trained us to ignore the intuitive healing connection that exists within and rely on sources outside of ourselves to “fix” us. However, it is of upmost importance to realize that each of us is endowed with intuitive inner knowing, self-healing and self realization abilities. As we begin to awaken these latent abilities, we begin to uncover our own inner expert, inner physician, healer, and shaman. Shamanic Breathwork can help reawaken and empower the transformational shaman within. Through a powerful and highly experiential healing process, the facilitator assists you on the journey to psycho-spirtual reconnection. Using the power of deep, rhythmic breathing, you journey within yourself, guided by the sacred sounds of drumming. Throughout most of human history, the shaman has been honored and entrusted with the task of restoring healing and balance to the individual, and thereby to the community as a whole. These ancient healers used sacred ceremonies, prayers, songs and chants to elevate spiritual well-being, thereby addressing the aches of the body, mind and heart. Shamanic Breathwork is an emergent healing method that builds upon these time-honored traditions by bringing the individual back home to his or her intrinsic healing wisdom. This transformative process can serve you in loving yourself and others more, empowering and inspiring you to create the world in which you desire to live. We begin the session by establishing sacred space through ritual such as smudging, chanting and intention-setting. The individual then lies down and focuses on surrendering to the inner healer or shaman, calling upon that which is most sacred to them—a higher power, spirit animals, or angelic presences, for instance. 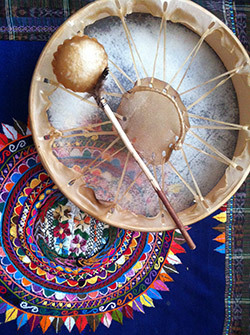 The drumming begins as the participant uses the power of breath to transition into a natural, dreamlike state in which the spiritual journey unfolds. Each individual’s experience of the Shamanic Breathwork process is different. Participants have reported altered states of consciousness; feelings of divine bliss; struggles or battles with negative forces in the psyche; spiritual rebirthing; and release from old, negative patterns. Because each individual’s journey is so unique, it is nearly impossible to describe the process accurately. It is truly something that must be discovered through experience.